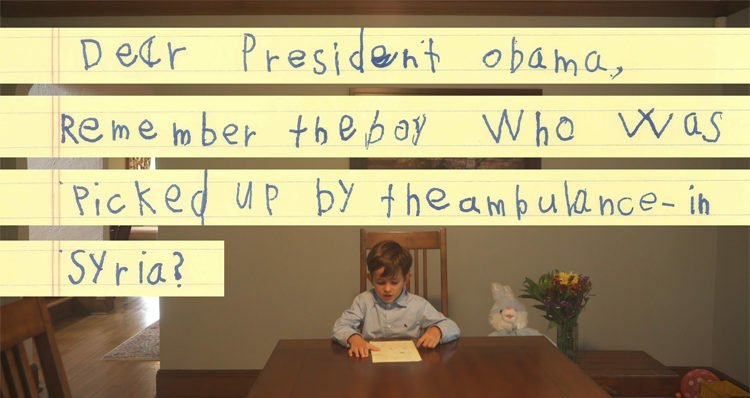 6-year-old boy sends moving letter to Obama about Syrian refugee. Alex, a 6-year-old from Scarsdale, New York, sent President Obama an inspiring message after seeing the distressing photo of Omran Daqneesh, “a 5-year-old boy who has become a reminder of the horror of the Syrian war after an image of his shell-shocked, blood-soaked body was shown on front pages around the world,” according to a report by NBC News. In the letter, Alex asked Pres. Obama to bring him to America to his driveway or the street so he could make him part of his family. BBC reports that Pres. Obama shared Alex’s words with the world at the United Nations summit on the refugee crisis earlier this week and posted the letter along with a video of Alex reading it on the official White House website. “The humanity that a young child can display, who hasn’t learned to be cynical, or suspicious, or fearful of other people because of where they’re from, or how they look, or how they pray, and who just understands the notion of treating somebody that is like him with compassion, with kindness — we can all learn from Alex,” the President said. Please tell him that his brother will be Alex who is a very kind boy, just like him. Since he won’t bring toys and doesn’t have toys Catherine will share her big blue stripy white bunny. And I will share my bike and I will teach him how to ride it. I will teach him additions and subtractions in math. And he [can] smell Catherine’s lip gloss penguin which is green. She doesn’t let anyone touch it. Thank you very much! I can’t wait for you to come!